Ever open your mouth but the words won’t come out? You’re not alone. Mustering up the confidence to actively and intelligently participate in meetings takes some serious courage (and planning). Bossy Skirt delivers a 3-part plan to unmute your mute button. You’ve got important opinions. Share 'em. 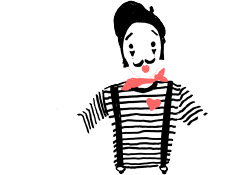 What can you do if you’re the one running a meeting with a bunch of mimes? Well, a lot actually—From limiting the long-winded to encouraging the meek, here’s how to get the mimers to step outside of their box. This one’s for our introverts. Speaking up is like ripping off a Band-Aid—painful, but better to get it over with quickly. In the first 5 to 10 minutes of a meeting to be exact. Take a look at a few more tips for quieter people looking to conquer the conference room.